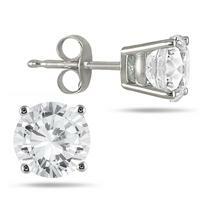 The classically dazzling look of fiery solitaire studs are a jewelry essential in every woman's collection. Two perfectly matched, sparkling round diamonds are delicately set in a high quality and durable basket setting crafted in solid 10K white gold. Simple and absolutely dazzling. These alluring and timeless diamond earrings will be treasured forever. A stunning pair of earrings, absolutely perfect for everyday wear.